The Spanish High Energy Physics community has organized the International Meeting on Fundamental Physics (IMFP) since 1973, covering theory and experiments from Accelerator, Neutrino, Astroparticle and Cosmic Ray Physics. The 2015 edition will have a special emphasis on Astroparticle Physics and will discuss topics in Cosmic Rays, Gamma Ray Astronomy, Neutrino Physics, Dark Matter, Underground Experiments, Gravitational Waves, Cosmology and Particle Physics. Roughly speaking about a half of the meeting will consist of 2-3 hour courses that should give a good perspective on selected topics such as particle physics for the next run at LHC, Cosmology after 100 years of General Relativity, Cosmic Ray Physics that will be completed with lectures on timely issues and/or experiments. 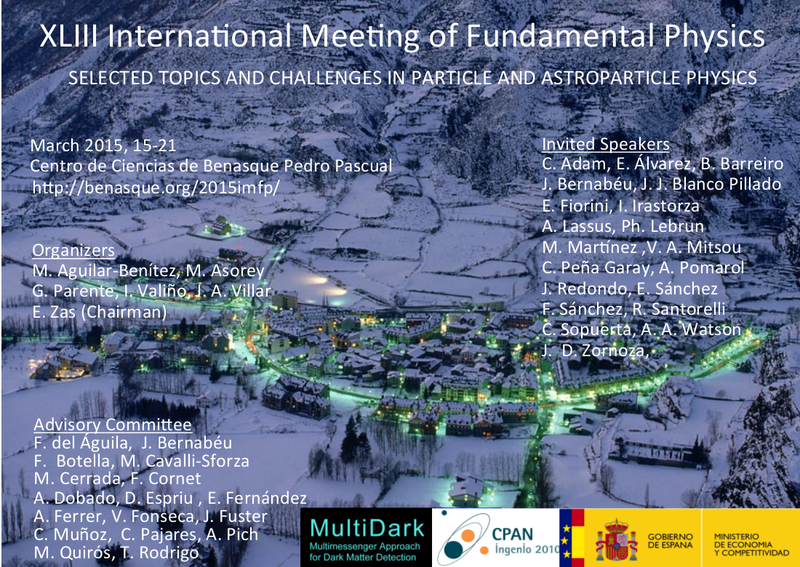 The meeting will take place at the Centro de Ciencias de Benasque Pedro Pascual (http://benasque.org), and it is supported by CPAN and Multidark. Benasque is a mountain village located 1140 m above sea level, in a valley in the heart of the Pyrenees. The beautiful landscapes and the proximity to large ski resorts make Benasque one of the main tourist sites in the region. Transportation to the ski center of Cerler will be provided during the breaks of the meeting (11:00-15:00h). The valley offers many interesting alternatives for those not skiing. The registration fee for this conference is 250 eur. 20 grants covering the full registration fee will be awarded to students and young post-docs. Please indicate 'I apply for a grant' in the 'other comments' field of your online application if interested.